Being aware of future weather conditions helps us to avoid uncomfortable or even potentially hazardous situations, like getting suddenly drenched by the rain or getting stuck in the snow on the road after missing an official snowstorm notification. 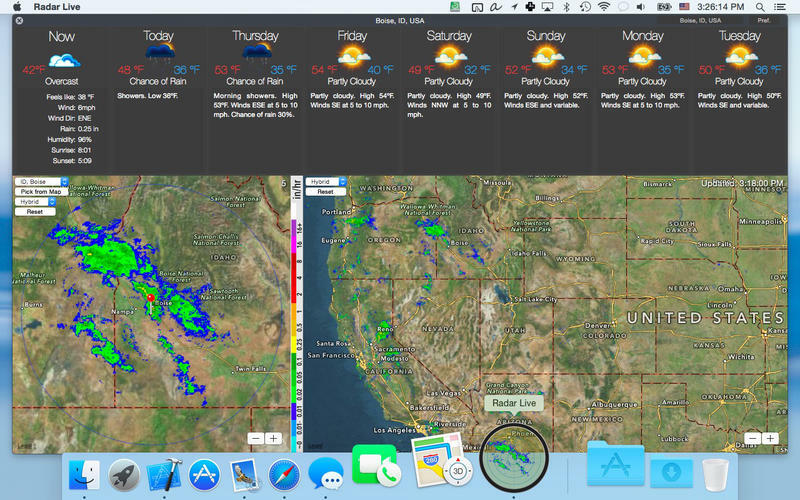 These 5 weather prediction apps let you keep informed of what's going on outside and when it will change - accurate weather forecasts, including tracking of daily and weekly fluctuations of temperature, humidity, and other vital indicators, right in your Mac Menu bar. 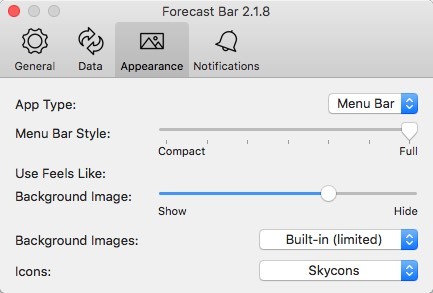 After looking closer into these weather forecast tools, we can definitely say that the weather stands no chance of delivering a surprise to their users. Most of the weather tracking apps we reviewed, provide impressive sets of functionality covering multiple astronomical and meteorological factors, including sunrise and sunset times, moon phases, UV index, etc. If you'd like to try forecasting yourself, some of the apps have real-time authentic radar data, while others are powered by modern AI and even a dark sense of humor. 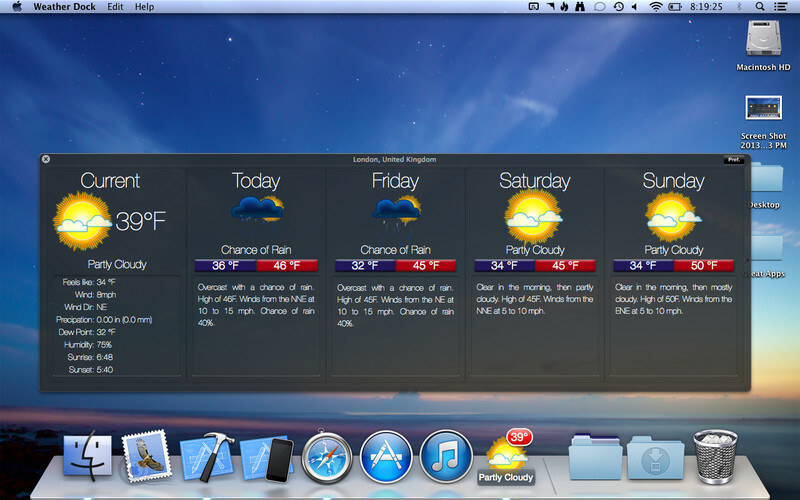 And finally, most of them are pretty customizable, giving you freedom in changing backgrounds, themes, animation speed, badge config, and other stuff making these Mac-based Weather Apps really handy and highly informative. Pressure, humidity, dew point, etc. 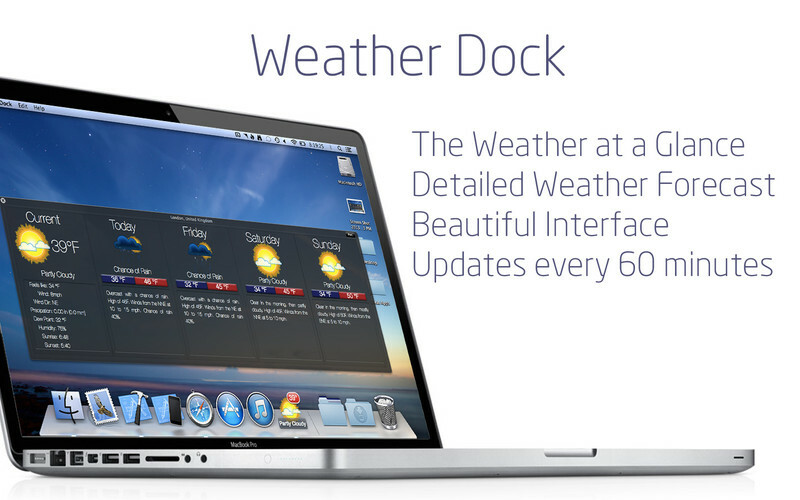 Weather Dock lives up to its name: it is a minimalistic app whose key feature is that it allows you to see a customizable animated Mac dock icon with weather conditions. Then, with a single click, you can delve into a more detailed report, such as a two-day future forecast. 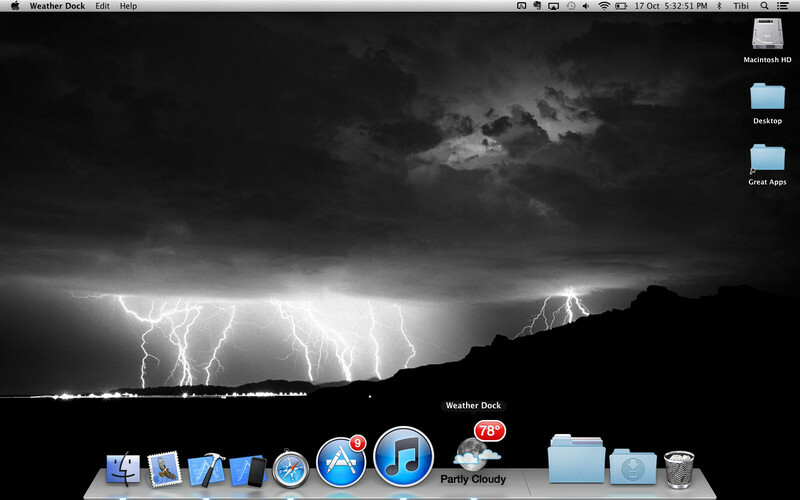 Its ability to get the dock icon customized is what makes it stand out among others: set a dock icon to show you the weather in a way you prefer (the current conditions or tomorrow’s forecast) and additional information, such as a real temperature vs feels-like temperature, wind data and so on. It's basically free with the in-app purchases of extra four days of the weather forecast, and some other stuff. Detailed two-hour forecast for three days (it's for free). Current and 'Feels Like' temperature. Dew point, humidity, pressure, wind info, etc. Icon badge that shows today's/tomorrow's min, max or 'feels like' temperature, wind info, etc. Custom text color and animation settings. Weather auto-updates every 60 minutes. The app provides a valid data worldwide supplied by Weather Underground. 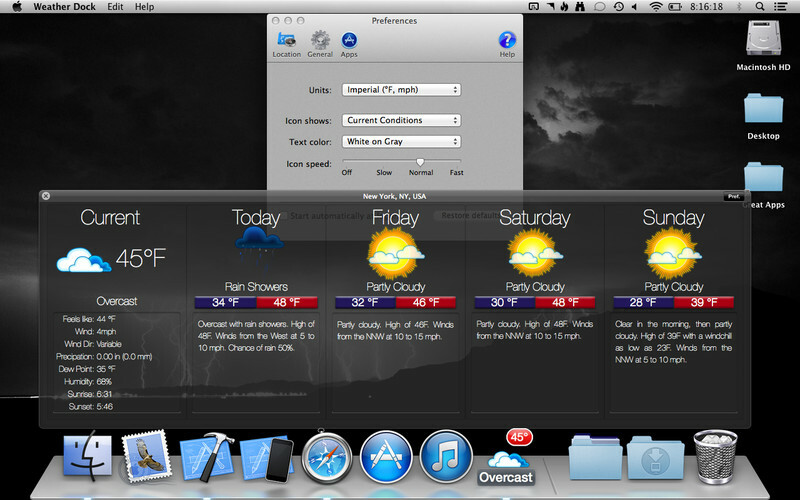 One of the best apps for getting a quick weather forecast right on the Mac screen. Powerful location search by name, zip code and airport code. Relies on a single source of weather data. Temp glitches with the icon showing incorrect numbers were reported by users. Well, RadarScope is not a good choice for an average user, but if you are a weather enthusiast, professional forecaster, or maybe you want to become one - it will give you tons of detailed authentic radar data to read and analyze for days! Probably, you can discover some phenomenon or spot a piece of nasty weather evidence even earlier than officials could. RadarScope is designed to let you work with a professionally arranged weather-defining data, including certain levels of customizations. It costs $29.99 USD, which may be a reasonable price for such a professional forecast package. Track reflectivity, velocity, dual-polarization, etc. Zoom in and out on the map. Keep an eye on tornados, thunderstorms, floods, and special marine warnings from the National Weather Service. 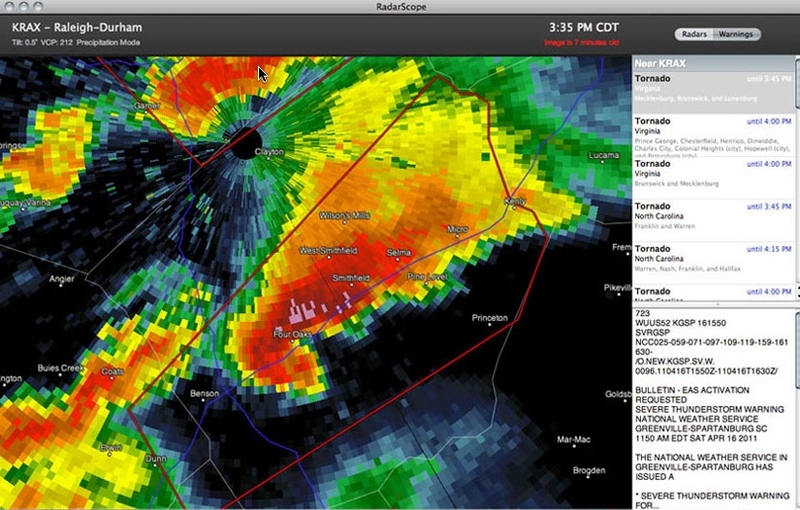 Browse through the list of active warnings in the sidebar and delve into details or go to the map as needed. Switch between 155 different radar sites. Copy the map being displayed or export it in a few common formats. TDWR and NEXRAD Level 3 data or Level 2 super-resolution radar data. Access data from multiple sites across the US, Puerto Rico and Guam on a variety of devices. Lets you view the original, not manipulated, radial NEXRAD weather radar on your Mac. Advanced notification and weather tracking functions. Choose weather sources at your option. Download and animate up to 20 frames of radar data. Not good for layman users as provides no basic data, such as predefined temperature or precipitation levels. It is a simple yet powerfully featured app, providing you with weather reports in many languages. It gives you a lot of flexibility in data representation and UI customization, in addition to some really interesting stuff like switching between different sources of data, animated gauges, trend charts, and having its forecasts supported by IBM's supercomputer in some respect. It comes for free but with the in-app purchases. An animated compass for wind info and animated gauge for humidity data. Sunrise/sunset time, Moon phase, UV Index, etc. Current cloud and temperature conditions: actual indicator, feels like, max/min, etc. 14-day forecast for the paid version. Select climate data providers: The Weather Company or Dark Sky, and make use of their best. Visualize data with charts: 24-hour temperature, precipitation, wind, humidity, UV index, hour-by-hour sky conditions, etc. Get weather descriptions in 40+ languages. 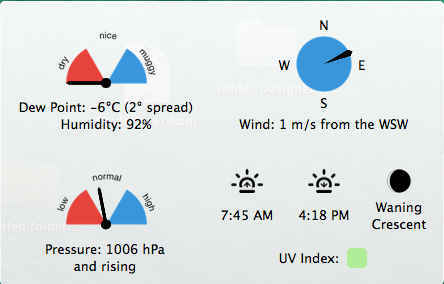 Use a customized weather summary revealing up to different 20 indicators. Animated radar and satellite imagery. It's an app for multiple devices that demands a separate subscription for each device. Certain lack of info about the company and the data collection policy. 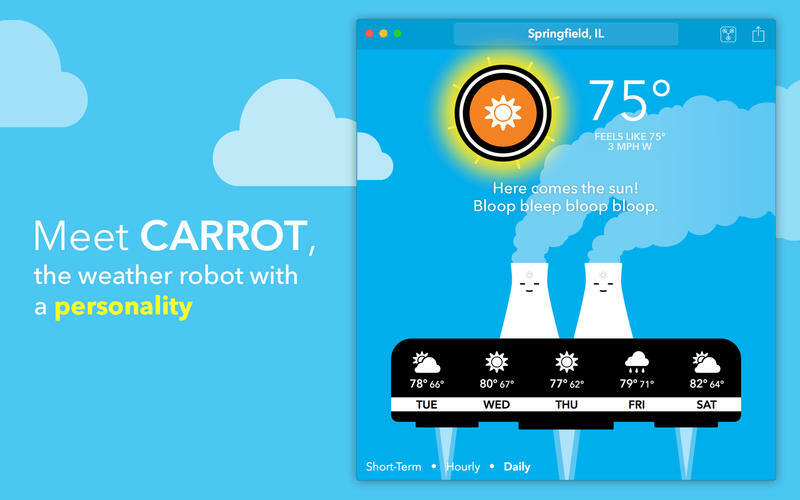 Described as a 'weather app with personality', Carrot shows weather forecasts in either short-term, hourly, or daily formats. It features so-called 'Time Machine' that allows you to restore the past date weather conditions in your location or predicts future weather based on historical data. It's full of meteorological and entertaining stuff. 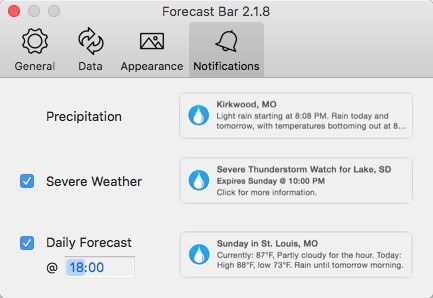 You can access Carrot in many system views and modes, including a full window, a menu bar icon, a minimized window, or even a notification center widget. It costs $11 USD. An animated overview of the current weather. Detailed weekly, daily or hourly forecast view. Use keyboard shortcuts to switch between views. Humidity, barometric pressure, dew point. Sunrise, sunset times, UV index. Snow amounts in inches or centimeters. Restores past and predicts future weather showing it on a timeline. Supported by a comic AI with a dark sense of humor generating catchy comments all the way. Characters and scenery vary in a cool unexpected manner according to the current situation. A great number of useful meteorological options. A two-step payment model: you pay for the app first and then for the rest of the features. Radar Live Pro takes climate data very seriously, providing you with pretty detailed weather forecasts and actual radar scans delivered right from National Oceanic and Atmospheric Administration (NOAA), which operates its own stations across the USA (and it's also a disadvantage as the radar data is valid for the US only). It features an elegant clean UI with tons of weather indicators and concurrent live overviews of remote locations you choose. 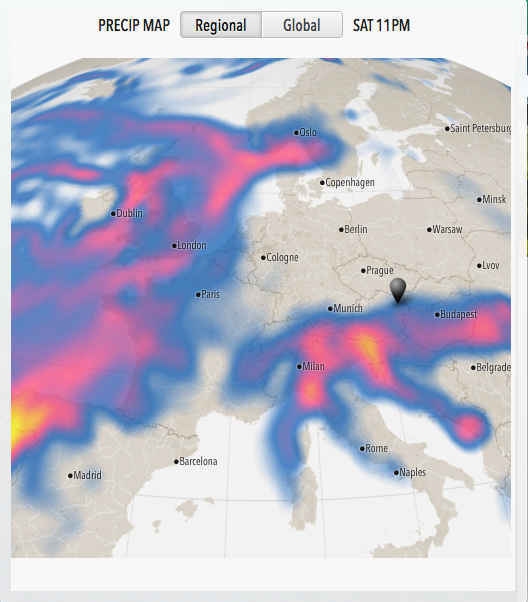 Radar Live Pro will surely warn you of any disaster coming up! It costs $7.99 USD. 2-hour detailed weather forecast for 3 days. Current vs 'Feels Like' temperature. Dew point, humidity, pressure and rainfall information. Switch between measurement units: Fahrenheit to Celsius, mph to kmh. Uses radar data provided by 155 meteostations of NOAA. 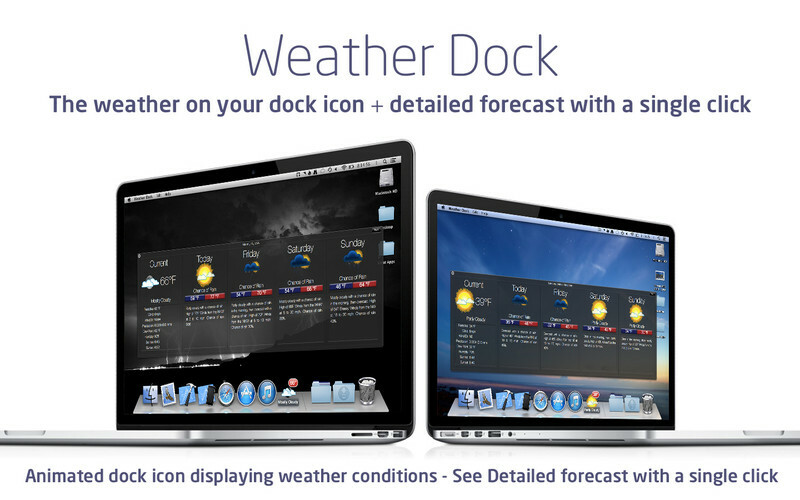 Get a detailed radar and weather forecast by a single click on the Dock icon. Pick as many locations as you need to track their conditions. Radar data on the map is original with no manipulations. The radar data is available in the US only (48 contiguous states). 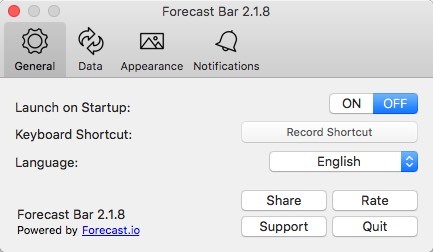 From now on, with one of these highly useful tools on your Mac, weather prediction is no more fortune telling, but a strict science and fun at once! You will always know whether a sunny or rainy day is coming, so you'll be totally confident about keeping or rescheduling your picnic appointment next weekend, or maybe you decide to cancel a long-range car trip in favor of a train ride if you see severe weather approaching. Some of the apps like Carrot Weather are full of entertaining stuff, while others, like RadarScope, are distinctly scientific and full of professional meteorological numbers and terms. What would be your choice? Please share in comments.